All Products Flextreme have passed Quality Control from production until distribution. Almost all Flextreme products are compatible with others brand products. Chassis Rackmounted use for many media converter in one place. Room with chassis rackmounted will have an esthetical view. Flextreme Chassis Rackmounted is the only one in Indonesia that have 2 redundant power supply. Media Converter can convert Multimode range (550 Meter) to become a Singlemode range (20 km) with multimode fiber optic cable. Media Converter can convert from UTP 10 Mbps or 100 Mbps to Fiber Optic 100 Mbps. Our Product can auto select for UTP 10 or 100 Mbps. 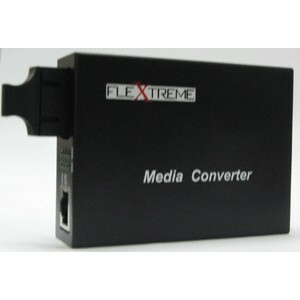 Media Converter can convert from UTP 10 Mbps or 100 Mbps or 1000 Mbps to Fiber Optic 1000 Mbps. Our Product can auto select for UTP 10 or 100 or 1000 Mbps. Media Converter can convert from UTP 10 Mbps or 100 Mbps or 1000 Mbps to SFP Slot. It should be use with SFP module for SFP Slot. Our Product can auto select for UTP 10 or 100 or 1000 Mbps.